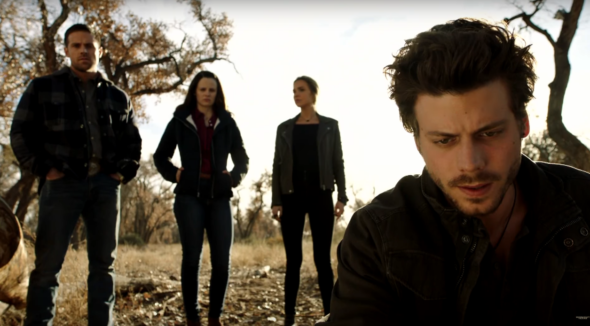 “I’ve been running for a long time.” This week, NBC released a new trailer for their upcoming TV series Midnight, Texas. Based on the book series by True Blood author Charlaine Harris, the supernatural drama follows the offbeat inhabitants of a small and isolated Texas town. There, witches, hit men, vampires, and all kinds “band together and form a strong and unlikely family.” François Arnaud, Dylan Bruce, Parisa Fitz-Henley, Arielle Kebbel, Sarah Ramos, Peter Mensah, Yul Vazquez, and Sean Bridgers star. Midnight, Texas is set to premiere on NBC on July 25th at 10 p.m. ET/PT. What do you think? Are you familiar with the Midnight, Texas books? Will you watch the TV series? More about: Midnight Texas, Midnight Texas: canceled or renewed?, NBC TV shows: canceled or renewed? Midnight, Texas on NBC: Cancelled or Renewed for Season Three? Midnight, Texas: Cancelled or Renewed for Season Two on NBC? Midnight, Texas: NBC Previews the Finale; Would You Watch Season Two? I read all the books and saw every episode…LOVED THEM ALL!!! Has left me wanting more!! PLEASE DO NOT CANCEL!!! Please renew Midnight Texas!!! Loved it!!! Hell yes I will watch it, love these kind of shows! I love the idea of this type of this type of show, but I never get to see who I want in them.